The Best Calling Card to Dominican Republic Is Here! Overpaying on calling cards to Dominican Republic? Well, things are about to change. 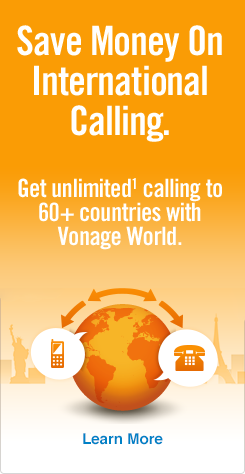 Introducing the Vonage Digital Calling Card! These Dominican Republic calling cards give you the best of Vonage with no monthly fees. That’s right, you’ll enjoy high-quality international calls, along with low per-minute rates with no monthly fees, no connection fees and no minimum charges. We’ll even give you bonus calling credit for putting more than $5 on your card — you could receive up to a 40% bonus credit when you buy $25 worth of minutes. Yes, Vonage is rewarding you for talking! Calls never cut off due to insufficient funds on the card, thanks to auto-recharge. And here’s how we know Vonage’s Dominican Republic phone card really is the best calling card to Dominican Republic: Calling rates to Dominican landlines are up to 50% lower than PennyTalk®, while rates to mobiles are 56% lower. You’ll get nearly twice the amount of talk time for the same price. We also know how busy you are, so we’ve made these phone cards for Dominican Republic completely self-service, meaning you manage and refill them online, all on your own schedule. And while you’re online, you can print out a paper copy of your Vonage calling card for Dominican Republic. So save big on your next call to the Dominican Republic with Vonage’s international calling cards, the only phone cards to Dominican Republic you’ll ever need. And if you need some help on dialing the Dominican Republic, check out our post on how to call Dominican Republic from the U.S. for techniques and tips.